The visually enhanced J&J News Center is geared at media, consumers, staffers, and stakeholders. NEW BRUNSWICK, NJ: In an effort to engage journalists and stakeholders, Johnson & Johnson has given its digital news center a facelift by sprinkling in more visual elements. The J&J News Center – which launched in September 2013 – was initially a home for press releases. But over the past six months, it has been used as a space to tell more stories in real time about the company, say Susan Rucci and Laura Donovan, who both manage J&J’s corporate social media team, and curate and edit the news center’s content. "As the digital landscape is changing, J&J is adapting and evolving as well, so we have redesigned the center to visually showcase our stories," said Rucci. "We noticed a really strong visual – whether it is a photo, graphic, or quote – can be really impactful immediately and have a long-lasting effect with the visitors to the site and our social media channels." The site’s content will now incorporate more blog posts, videos, photos, and external earned media about J&J. 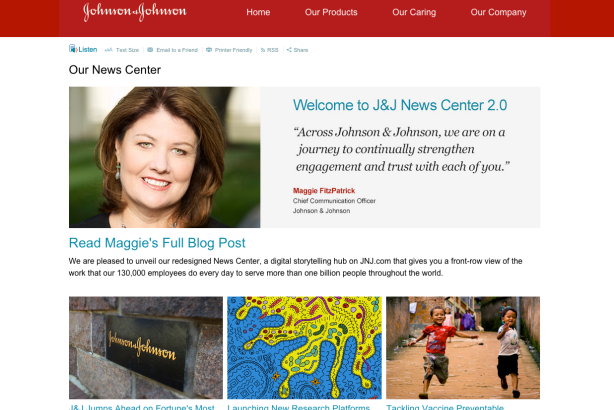 A blog post by J&J CCO Maggie FitzPatrick currently graces the top of the news center’s page, outlining the changes. Under the post sits six news stories with colorful thumbnail images about J&J staffers, the company’s performance, research updates, and its efforts to tackle vaccine-preventable childhood diseases. "We want to have a three-dimensional storytelling approach to give people more context,"said Donovan. A new Ebola page has also been added for J&J to share its efforts to fast-track the company’s vaccine program. A picture slideshow of J&J’s Ebola partners on the front lines and infographics on the global collaboration to fight the disease could be found on the page on Wednesday. Thought Leaders is another new section on the site, featuring quotes from executives across J&J. Additionally, the news center’s Follow Us page has been enhanced so visitors can clearly see all of the platforms the company is using to communicate externally. The news center has brought in over 90,000 visitors since its inception, and the @JNJNews Twitter handle accrued 50,000 of its 96,000 followers in the last year alone, according to Donovan. Rucci attributes the sudden rise in followers to J&J’s Ebola news coverage, which started in September 2014. "Clearly people want to have access to this news and we feel like we have a responsibility to provide it to them as quickly and accurately as possible," she said. Princeton, New Jersey-based design agency Local Wisdom is aiding J&J to build multimedia assets onto the site. No PR firms are helping with content creation, said J&J’s VP of media relations Ernie Knewitz. "The news center is a tool for engagement to drive trust and stimulate conversations about the company and what we are doing around the world," said Knewitz. "The site is geared not only at reporters, but employees, shareholders, and anyone who uses J&J products." Last month, Johnson & Johnson’s global communications structure was centralized under FitzPatrick. When asked if J&J’s agency relationships will be evaluated in relation to the in-house comms changes, Knewitz said at the time that FitzPatrick wants to make sure its 150 agency partners are aligned with the company’s vision and have the right capabilities to complement its resources internally. FitzPatrick told PRWeek via email on Wednesday that she has no updates on J&J’s agency evaluations.